Howard Charlton Brown was born in Beeston, Notts in October 18932, the second child, only son of Josiah Henry (b. c1869, Attenborough, Notts) and Ellen Brown (b. c1869, Chilwell, Notts née Kilbourne). In 1901 the family, including all three children and Ellen's widowed mother, was living on High Road, Chilwell with Josiah working as a lace warehouseman3. By about 1905, the family had moved from Chilwell to neighbouring Beeston. By 1911, the family was living at 29 Imperial Road. By then, the 17-year-old Howard, was working as a warehouse clerk, probably alongside his father4. Unfortunately, Howard's Army Service Record has not survived so we don't have precise details of his enlistment but it appears to have been in October 1914. It is also known that he landed in France on 14th July 1915 and would have undergone training before that date. Although most existing records record that he served with 2/5th Battalion Sherwood Foresters, this must have been later in the war as this battalion went first to Ireland and did not arrive in France until February 1917. Another suggestion, that he was with 12th Battalion is also unlikely as this battalion left for France in August 1915. Although no written confirmation has been found, and based solely on his arrival date, it is most likely that in the early part of his service he was with 10th battalion. This unit was formed at Derby as part of Kitchener's Second New Army on 13th September 1914, coming under the command of 51st Brigade in 17th (Northern) Division. After initial training locally, the regiment underwent final training at Wool and West Lulworth Training Camps in Dorset and at Winchester5. It had been intended to use the division for Home Defences but this decision was changed and the battalion left for France, landing at Boulogne on the 14th July 1915. As part of 17th Division it concentrated near St Omer and moved into the Southern Ypres salient for trench familiarisation, taking over the front lines in that area. In the spring of 1916 they were in action at the Bluff, south east of Ypres on the Comines canal. The battalion then moved south to The Somme, seeing action during The Battle of Albert in which the Division captured Fricourt and took part in the Battle of Delville Wood - known as "Devil's Wood" by those who fought there - which had been captured by the 1st South African Infantry Brigade on the 15th July 1916, who continued to hold it, at very great cost, until the 19th. The fighting had been, and would continue to be, extremely fierce and by the time it came to an end on the 3rd September the wood had been completely destroyed with only the stumps of trees remaining. On 5th August, 10th Battalion had relieved the 9th Duke of Wellington Regiment at Longueval, taking over a line that was by now just a series of shell holes, roughly joined and with no connection between the front line and supporting trenches. Heavy shelling made all efforts to improve the position extremely difficult. During several unsuccessful attacks on Delville Wood, in conjunction with The Border Regiment, they were held back by heavy machine gun and rapid rifle fire. During six days of fighting, 1 Officer and 43 other ranks from the battalion were killed and many more were injured6. 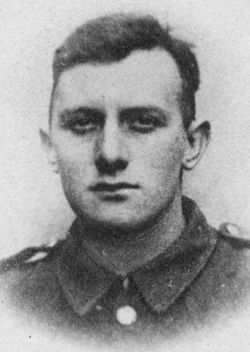 If, as seems likely, the then Private Brown had been part of 10th battalion during these months, it would have been a terrible introduction to the realities of the Western Front for him and his colleagues. However, during this time, he must have demonstrated the leadership qualities needed for promotion as, over the next eighteen months or so, he would be promoted through the ranks to become a sergeant. This may well have coincided with his transfer, at some point. to the 2nd/5th Battalion Sherwood Foresters - part of 59th Division, 178th Infantry Brigade - probably upon their arrival in France in February 1917. That being the case, he would have taken part in the pursuit of the German retreat to the Hindenburg line in March/April 1917 and, from September onwards, faced the horrors and atrocious conditions of the Third Battle of Ypres - usually known as Passchendaele. During March, the battalion was near Bullecourt taking turns in the front-line trenches. A major attack by the enemy had been expected for some time as enemy positions had been strangely quite. Then, on 21st March, the German Army launched its Spring Offensive from the Hindenburg Line with the objective of ending the war before American troops and resources could tilt the balance towards the Allies. The objective was to smash through the Allied lines, push the British forces into the sea and to cut off their supply lines by seizing the ports. 2nd/5th Battalion, which was being held in support in the village of Noreuil at the time, was soon brought in to help defend the line but came under very heavy shelling - including a large amount of gas shelling necessitating the use of respirators. The men fought resolutely in the face of the subsequent very strong attack. But eventually, with heavy machine-gun fire on three sides, heavy losses and the enemy continuing to advance strongly, eventually the position became impossible to sustain. The losses on that day were horrendous. The battalions strength for the month as a whole - with most losses during this single attack - was reduced from 48 officers and 950 other ranks to just 6 officers and 204 men. Many of the casualties were killed or missing7 - amongst those missing was Sergeant Brown and his body was never found. Even years later, it seems, the family clung to the hope that he was still alive8. Having no known grave, Sergeant Brown is remembered on the Arras Memorial in the Faubourg-d’Amiens Cemetery which is in the Boulevard du General de Gaulle in the western part of the town of Arras. The cemetery is near the Citadel, approximately 2 kilometres west of the railway station. The Faubourg-d’Amiens Cemetery was begun in March 1916. It continued to be in use by field ambulances and fighting units until November 1918. After the Armistice the cemetery was enlarged when graves were brought in from the surrounding battlefields and from two smaller cemeteries in the vicinity. The cemetery contains 2,651 burials from the First World War. The Arras Memorial commemorates almost 35,000 soldiers from the United Kingdom, South Africa and New Zealand who died in the Arras sector between the spring of 1916 and 7th August 1918 and have no known grave. 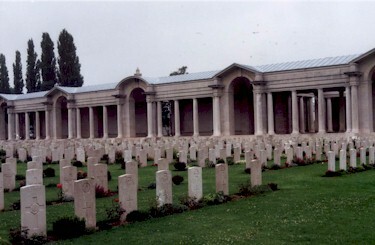 The most conspicuous events of this period were the Arras offensive of April-May 1917, and the German attack in the spring of 1918.The cemetery also contains the Flying Services Memorial which commemorates nearly 1,000 airmen of the Royal Naval Air Service, the Royal Flying Corps, and the Royal Air Force, either by attachment from other arms of the forces of the Commonwealth or by original enlistment, who were killed on the whole Western Front and who have no known grave9. Sergeant Brown was posthumously awarded the British War Medal, the Victory Medal and the 1915 Star10. His Army financial effects of £36 14 3d, including his War Gratuity of £23, were paid to his father, as his sole legatee on 27 May 191911. After the war, his parents and sisters were left to live out their lives in Beeston. Josiah died in 1929, aged 60. Frances married Frederick W Henson had married Frederick W Henson in 1926 but was widowed shortly afterwards and returned to teaching and to her mother's home. At some point in the 1930s, mother and two daughters moved to a council house at 100 Dennis Avenue where they lived out their respective lives. Ellen senior died in 1926, Frances in 1960 and Ellen junior in 196212. In addition to the main war memorial in Beeston Parish Church, Howard's name also appears there on a memorial to Church Sunday School teachers who were killed in the Great War. 2His precise birth date was recorded at the time of his baptism on 3rd December 1893 at Attenborough Church (A Parish church that then served an are than included Chilwell). His birth was registered in Basford Registration District (of which Beeston was then part) in Q4/1893 (Ref 7b 201). It appears likely that the family moved from Beeston to Chilwell immediately after Howard's birth. 3Chilwell, Notts, 1901 Census, Piece 3208 Folio 12. 4Beeston, Notts, 1911 Census, Piece 20428 RD429 SD3 ED3 Schedule 65. 5His date of enlistment is based on the amount of his War Gratuity. The date of his entry into France is recorded on his Medal Card. This date also precludes his eventual battalion (2nd/5th Sherwood Foresters) as being his original battalion as 2nd/5th did not land in France until February 1917, having previously been stationed in Ireland. A slight suggestion on his Medal Card that he may have been attached to 12th Battalion is also precluded as it did not enter France until August 1915. 6This account of 10th battalion's involvement in the action is based on its War Diary (available at ancestry.com). 7This summary of 2nd/5thth battalion's involvement in the action and the losses sustained are from its War Diary (available at ancestry.com). 8As late as March 1920, an 'In Memoriam' by his family in the Nottingham Evening Post (21 March 1920) still used the words "..missing March 21 1918.". The possibility that he had been taken prisoner was apparently still clung to. 10Details from Frederick's Medal Card and Medal Roll - available on ancestry.com. 11Details from "Army Register of Soldiers' Effects, 1901-1929" - available on ancestry.com. 12Josiah died on 26 February 1929, probably in Beeston. By September 1939, Ellen and her two daughters were living at 100 Dennis Avenue, Beeston (1939 Registration). Ellen senior died on 22 June 1952, probably at Beeston. Frances died on 18 September 1960, probably at Beeston and Ellen junior at Nottingham General Hospital on 31 May 1962 (Source : Probate Calendar for all dates of death). The image of Sergeant Brown is from the Imperial War Museum Bond Of Sacrifice 1914-1918 Collection - Ref © IWM (HU 114512).